The painting above is “The Ray” by Jean-Simeon Chardin (1699-1779) and is remarkable for the rendering of a gruesome scene as something compellingly sublime. Of it Marcel Proust wrote: “strange monster…tinted with red blood, azure nerves, and white sinews like the nave of a polychrome cathedral”. Imagine! An intellect as great as Proust comparing a painting of mangled dead sea ray with the central aspect of a type of architecture that reached its zenith there inFrancesome centuries earlier. 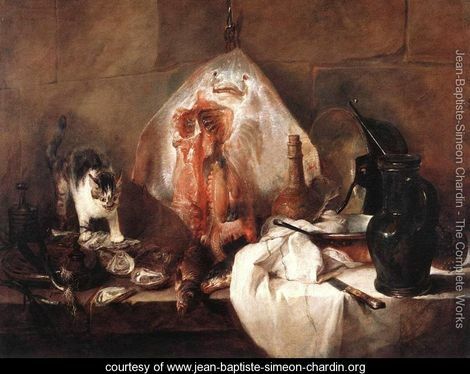 Philosopher Diderot wrote of Chardin’s talent: “secret of redeeming through skill the disgusting aspect” of a reality. Reminds me of writer Cormac McCarthy who accomplishes the same feat (maybe even outdoes Chardin) with his prose. Check this out: “His entrails were hauled forth and delineated and the four young students who bent over him like those haruspices of old perhaps saw monsters worse to come in their configurations”. OK. It is clearly impossible to convey, with a short excerpt, the entirety of a book in the way one can of a picture with a reproduction. But of its essence a great writer might. Let me elaborate a bit on that sentence and hopefully you’ll get an idea of the magnitude of McCarthy’s skill. Those words come near the end of Child of God and describe the final stages of a med-school dissection of the corpse of the chief protagonist and in their brevity almost recapitulate the entire work. Elmer Ballard was a murderer and necrophiliac who roamed the hills of East Tennesse, was never indicted, and checked himself into the state home (“I’m supposed to be here”) where he died. Ballard was then the referent to the idea of “monsters worse to come” and one of those he indeed was. The redemptive qualities of McCarthy’s prose McCarthy draw us inexorably through the stunning tale. It’s not that we can’t look away – we don’t want to. The title of the book is also a referent of a word in the sentence quoted above. Taken at face value, Child of God says that yep, white with the black, we are all part of the Lord’s flock. Taken ironically: the thought of a dude up there in a robe and slippers is no less nuts than the reading the future in entrails – which is what a particular sort of ancient Roman priest (a “haruspex”) did. *Chardin’s painting came to mind from reading Mary Tompkins Lewis’ take on it in the 10/8+9 WSJ. This entry was posted on October 15, 2011 at 5:23 pm and is filed under Art, Literature. You can follow any responses to this entry through the RSS 2.0 feed. You can leave a response, or trackback from your own site.